You’ve actually seen some of the first three Acts already, and we probably won’t be revealing too much more than what we’ve already shown. We really want to try to keep as much a surprise for you when you play through the game the first time as possible. We will be announcing all of the game systems though before beta, so there are a few things left as far as reveals go. While beta will obviously be a lot of fun, should you get the chance to get in and help test, it’ll only be a small part of the whole game. Some people want to know everything, but we’re really trying to preserve the surprise and wonderment (that we hope will come with exploring Diablo III) as much as possible. 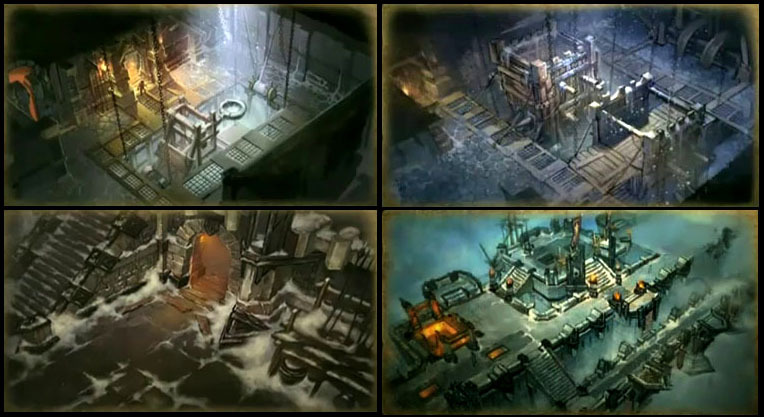 We’ve got gameplay movies and tons of screenshots from a few (but not all) parts of Act One and Act Two, but all we’ve seen of Act Three (set in the icy northern Barbarian Lands around the Arreat Crater) is Bastion’s Keep, as presented in the Crafting Sanctuary panel at Blizzcon 2010. As for the beta content, most of us had been predicting that it would be something like the Diablo II beta. (Just Act One and the first 3 tiers of skills.) It’s nice to get some confirmation, though. Just what “only be a small part of the whole game” means is open to debate, of course. All of Act One up to the Act Boss to save that as a surprise? Most of Act One with some plot/story stuff clipped out? I’m also curious to see if some version of the Arena will be included in the beta. I expect so; the devs must need to do a lot of testing on it, especially on the matchmaking system for arranging fair matches with randomly-selected 3v3 teams, and they can’t very well do that with just their in-house devs and Q&A; they need tens of thousands of characters colliding repeatedly to fine tune the system. Unless they just plan to work on it post-release, when characters will be so much more varied in type and power. Activision Blizzard Set Conference Call Date - Diablo Beta News?